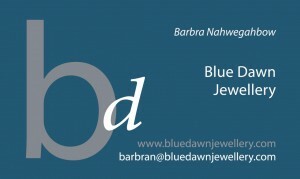 Blue Dawn Jewellery specializes in bold one-of-a-kind designs equally wearable and appropriate for a quiet evening out with friends, a day of shopping or a glamorous red carpet event. Luscious large gemstones such as turquoise, green garnet and carnelian might be combined with copper chain to create a distinctive piece of jewellery. Or moonstone with a large piece of grey-blue agate as a pendant and silver-coloured metal hardware. Or warm ebony beads combined with multiple strands of red coral in various shapes and sizes accented with sterling silver beads. Aboriginal jewellery designer Barb Nahwegahbow uses quality, distinctive and often fun materials in her designs. “My favourite stone when I started designing was turquoise,” she says. “Turquoise is a stone that’s been highly prized by Native people because it represents strength and power and symbolizes the blue of the sky. Since I’ve been designing, I have grown to love all gemstones – aquamarine, tourmaline, garnet in all its wonderful shades, sapphire, moonstone, lapis and the list goes on.” Barb often combines these stones with hand-made porcelain pieces, hand-felted beads, or sterling silver beads and chain. Barb also works with clients to design custom pieces to suit both the occasion and the budget and personality of the wearer. Barb Nahwegahbow was supported by the Ontario Arts Council through a $500 grant in October 2013 for materials and supplies in order to create more work!